The KazNu event is part of UNESCO Almaty’s efforts to raise awareness on environmental migration in the region; in Kazakhstan, the continuing social and economic impact of the Aral Sea disaster has devastated agriculture in surrounding areas and caused the dislocation of populations in Kazakhstan and other Central Asian countries. 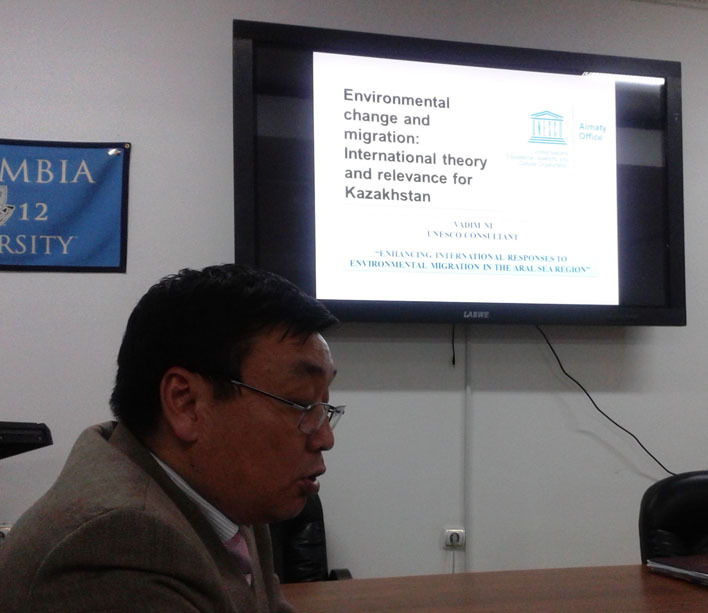 Mr. Ni introduced to KazNu students the legal challenges associated with status for those who migrate due to environmental degradation. The field study underway in the Kyzylorda region near the Aral Sea will give us new information on migration processes there and also gauge people’s knowledge and attitudes about environmental change and social vulnerability. The lecture is part of the Global Classroom Masters in Development Planning Programme, organized at KazNU in cooperation with Columbia University, New York. KazNu maintains a close partnership with the United Nations in Kazakhstan and is the only Central Asian member of the UN’s Academic Impact university initiative. Dr. Rafis Abazov, Director of the Global Classroom Project at KazNU and Adjunct Assistant Professor of Public Affairs at Columbia University (New York) has organized a series of lectures on topics of global relevance and with local impact. The results of the field study will be highlighted at the upcoming conference and training on social integration of migrants, “Improving Migration Management at the Local Level,” to be held in Shymkent 14-15 May 2013. This event will be held in partnership with The OSCE Center in Astana, The OSCE Office for Democratic Institutions and Human Rights (Warsaw), UN Women and the South Kazakhstan Regional Administration, and with the participation of the Parliament of the Republic of Kazakhstan, the Ministry of Labour of the Republic of Kazakhstan and UNHCR.